At around 9.45 am the problem occurred, when the train was en route National College Metro Station and many passengers at subsequent stations were left waiting. 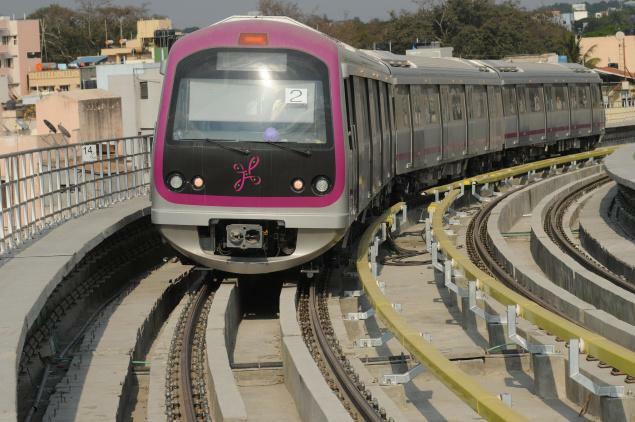 Bengaluru: On Thursday commuters on Bangalore Metro’s Green Line were forced to wait for over half-an-hour for a train after a technical glitch in one of the trains while it was travelling from Yelachenahalli to Nagasandra. At around 9.45 am the problem occurred, when the train was en route National College Metro Station and many passengers at subsequent stations were left waiting. Due to glitches services was delayed hundreds of passengers while they were commuting to work. Bengaluru Metro Rail Corporation Limited (BMRCL) Managing Director Ajay Seth said that on Thursday about at 9.46 am, a train running from Yelachenahalli to Nagasandra on the Green Line developed a technical snag while approaching the National College Metro Station. We introduced an additional train from Nagasandra, two trains from Rajajinagar and one train from Peenya industry to normalise the situation. Passengers had to be offloaded at National College, Rajajinagar, Peenya Industry and Sampige Road and cleared by the following trains. The incident halt the schedules of hundreds of commuters headed for offices out of gear. The commuters at the time had to get off at National College, Rajajinagar, Peenya Industry, Majestic and Sampige Road stations. BMRCL confirmed the problem was fixed and train services were restored as per the schedule from Yelachenahalli to Nagasandra stations, at approximate 10.57 am. A train on the Green Line unexpectedly stopped near Rajajinagar Metro Station. While BMRCL maintained that the train operator brought the train to a halt as a precautionary measure, has claimed that the incident occurred since the train was being driven by a junior and inexperienced employee and that he had travelled too fast near a curve on the tracks, claimed BMRCL Employees’ Union vice-president Suryanarayana Murthy.